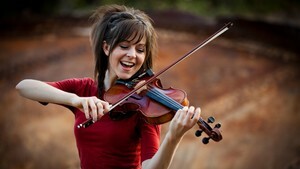 Lindsey Stirling, star of iTunes and YouTube, has astounded audiences with her animated dancing and unconventional violin performance of original tunes, hip-hop, and classical music. Her first album released September 18, 2012, and showcased her violin-electronic-dubstep style with ten original tracks, showcasing her most popular pieces. To date, she has sold over 300,000 downloads of her songs and has been at the top of the digital electronic charts and in the Top 100 for iTunes. Her YouTube channel, Lindseystomp, has more than 5.7 million subscribers as of November 2014 and has received over 820 million views. She confesses to learning how to dance by studying YouTube tutorials. Lindsey was a 2010 finalist on “America’s Got Talent,” where she was dubbed the “hip hop violinist.” Since then, she has performed in London, Italy, and Kenya and is planning a 2012 US tour of 24 cities from Los Angeles to New York in the fall. A returned Mormon missionary to New York for The Church of Jesus Christ of Latter-day Saints (Mormon or LDS), she was born September 21, 1986, in Santa Ana, California, and moved to Gilbert, Arizona, when she was eight. She resided in Provo, Utah, when she was a student at Brigham Young University to study film making and then changed her major to therapeutic recreation. She now lives in the Los Angeles area. During an interview, she explained how her life-long love of the violin began. A classically trained violinist, Lindsey was “burnt out” on classical music when she was 16 and joined a pop-punk rock band, “Stomp on Melvin.” It was there that she discovered the versatility of the violin. When the band members all left to serve LDS missions, she started writing music to her favorite radio hits and eventually started writing her own music. Lindsey explained that it is important to her to write a variety of music that has a fresh style that is always new. “My musical style is a reflection of my personality, and through it I hope to share my belief that no one should be afraid to be themselves. All my songs were created to depict specific themes that I pulled from my own life experiences. ‘Spontaneous Me’ is about having the courage to love yourself for who you are. ‘Crystallize’, on the other hand, is a much deeper song: the crystallization of water is affected by its surroundings to create either beautiful patterns or meaningless masses. Similarly, I believe that through our thoughts, beliefs and the environments we create, we each possess the power to make a positive change within ourselves and others. To earn money for college she entered the “America’s Junior Miss Pageant.” Surrounded by girls in elegant evening gowns, she performed violin rock songs with spiked hair and high socks. She won the talent competition in her city, state, and nationally. “It's funny, the same things I loved doing in high school are the things I do now for a living,” she said. She advised aspiring artists to take every opportunity for exposure. “It’s through doing a lot of the free stuff in the beginning that I have had the opportunity to do really cool things. I’ve done things like open mike nights and being a part of other artist recordings, just doing all these things. Also, don’t give up. You are going to receive 99% rejection at first. Just be resilient to it. It only takes one person; only one person has to believe in you. So you have to handle the rejections and have hope. Lindsey is solid in her Mormon beliefs, as is manifest by her willingness to donate eighteen months of her life to the pure service of the Lord, setting aside her musical aspirations to do so. A Deseret News article of April 2013 speaks of Lindsey's battle with anorexia and discouraging put-downs from the music industry. It was when Devin Graham helped her to produce youtube videos that her luck began to change. No one in the music industry could envision her as a quirky soloist. They wanted her to join a band. By April 2013 Lindsey had mounted almost 50 videos and had more than 2 million subscribers. Her video "Crystalize" was the No. 8 top-viewed video of 2012, with more than 42 million views. It has more than 55 million views today (April 2013). Regarding her eating disorder, Lindsey found herself realizing by the Holy Spirit that her constant sadness might need to be addressed. "I still believed that I was a daughter of God, but I had to feel that again. That and my family were the biggest things that I think saved me from this downward spiral I had gotten stuck in." Stirling talks about overcoming her eating disorder in her "I'm a Mormon profile" on Mormon.org. Her eighteen months of Mormon missionary service taught her she can get along with anyone, if she relies on the Spirit. That helps her when she is touring with a group of associates. It has also helped her to retain her values in the entertainment industry, not an easy thing. "Despite her busy schedule, she is careful to maintain a scripture study routine with two other members of her crew." "I have a full testimony that when we stay true to obeying the commandments, and keeping those things first in our lives, that we are entitled to blessings," she said. "I feel my mission was preparatory for my mission in life. It prepared me to do what I’m now doing and use it in a small way to try to bring light to people in whatever way they want to accept it. I will be forever grateful that I got to serve a mission." In 2013 Lindsey was a guest artist performing with the Mormon Tabernacle Choir at the LDS Conference Center at Temple Square in Salt Lake City for the occasion of Mormon Pioneer Day, honored on the 24th of July each year. The performances were on the 19th and 20th of July, with the final performance streamed live over the internet for the enjoyment of as many people as possible. Lindsey continues to make waves through the music world with over 820 million views on YouTube, Billboard chart-topping hits, and sold-out tours worldwide. Her first album has sold over 350,000 copies in the United States without the backing of a major label. It has gone platinum in Germany and Gold in Switzerland and Poland. Her second album Shatter Me debuted at number 2 on the Billboard Top 200 album chart. She is also a motivational speaker who tells youth to have confidence in the ways they are unique. In the second of four Face-to-Face Live Facebook Youth events, moderated by David L. Beck, Young Men general president, and Bonnie L. Oscarson, Young Women general president, Lindsey Stirling performed and answered questions submitted by youth of the Church of Jesus Christ worldwide. The church-sponsored event was broadcast live (on November 25, 2014) on the LDS Youth Activities website, LDS Youth Facebook page, and the Mormon Channel on YouTube. The first event featured David Archuleta. On July 23, 2015, the a capella group Pentatonix received gold certifications for “Daft Punk” and “Radioactive (featuring Lindsey Stirling).” Under the terms of the RIAA Digital Singles program, a gold certification confirms a US unit total in excess of 500,000. One unit is equal to one paid download or 100 streams. I've received a lot of hate over the last 2 days and I'm sorry for anyone that I've disappointed. The dress I wore to the awards was fully lined with tan fabric. But after looking at the pictures, I see that you actually can't tell that it's lined. In hindsight it wasn't the best choice because modesty is important to me. However, more importantly it makes me so sad that people are so quick to judge. Especially all the "Christians". I make mistakes, and I am definitely not perfect, but I really am trying my best. I tried on racks of dresses before I found one that actually covered me and I want to thank the designer and my stylist for making a dress that could make me feel beautiful and still keep me completely covered from head to toe. For those who say I've changed, I still believe in Christ and although I'm not perfect, I strive to share his love and positivity with those I meet. In March 2015, PBS aired her live show from London in selected areas. Also in 2015, she extended her 2014 world tour of her second studio album, Shatter Me. She announced that she would begin work on her third studio album at the conclusion of this tour. On January 9, 2015, Billboard announced that Shatter Me and Lindsey Stirling had reached the first and second position as the best-selling dance-electronic albums in 2014. She was also featured on the Forbes’ list '30 Under 30' as one of the few musicians featured in the top thirty of recognized celebrities under the age of thirty. On June 21, 2015, Stirling announced that over the course of two and a half years, she had completed her autobiography The Only Pirate at the Party. She also graduated from Brigham Young University. With virtually 7 million YouTube subscribers, more than 3 million Facebook fans, and almost half a million Twitter followers, she still made it a priority in her life to finish her bachelor's degree in recreation management in August 2015 at BYU. She was invited to perform at the ceremony. On August 19, 2016, she released her Brave Enough studio album. She released the first single, "The Arena," in June. The second single, "Something Wild," released in July, and features Andrew McMahon. The music video released in August. The song is featured in the end credits of Disney's 2016 remake of Pete's Dragon. She released the third single, "Prism," in August. This page was last edited on 12 September 2016, at 20:01.